Today?s managers need more than a clear understanding of what it takes to supervise operations through quantitative techniques, technology, and processes. They also need to learn how to effectively coordinate those operations across a global supply chain. 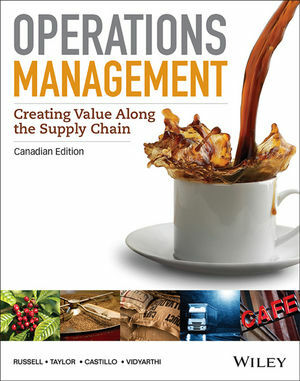 The Operations Management: Creating Value Along the Supply Chain, Canadian Edition provides a solid foundation for both qualitative and quantitative operations processes, teaching students how to analyze operational processes designed to ensure quality, create value, and optimize output in order to make organizations more successful. The authors successfully make complex topics easy to understand with frequent real-world examples, virtual online tours of service and production facilities and easy-to-understand example problems. Available with WileyPLUS, an innovative research-based, online environment for effective teaching and learning, students will be able to practice their quantitative skills while in the context of the course?s learning objectives. Creating value along the supply chain framework: Helps students understand how to create value along the supply chain and make companies more successful through analyzing processes, ensuring quality, and managing the flow of information and products. Quantitative techniques made easy: Thoughtful and plentiful solved examples, varied homework problems and questions, and cases help students develop techniques for solving OM problems. Emphasis on sustainability: Added in each chapter to help students think strategically about sustainable practices Global operations: Examples in each chapter show the impact of global operations and how globalization affects operating decisions. Excel files and solutions: Automate the use of analysis tools and techniques, while helping students automate computation and make quick managerial decisions. Virtual Tours: Online tours of service and production facilities help students see the day to day operations of various firms. Office Hour Videos: Done by the text author, these screen-capture videos will walk students step by step through a selection of end of chapter problems and cases. OM Video Series: Video clips are based on the Malcolm Bridge Award Winners and feature interviews and footage from major corporations.